Your Grandfather is a rock of stability for the family. He provides guidance, structure and of course love and friendship. Honor your Grandpa with a Personalized Grandfather Pen Set as a handsome Personalized Gift made just for him. 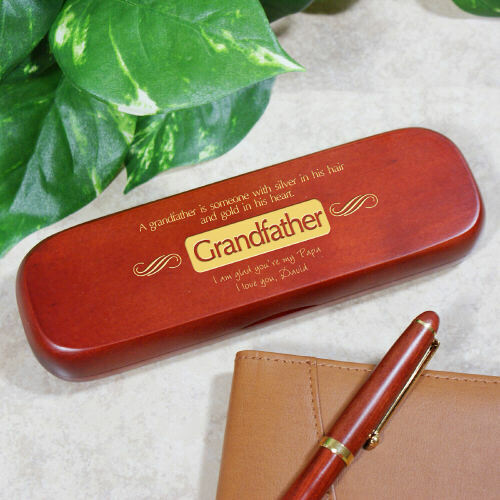 Engraved Pen Set for your Grandfather is presented with a matching rosewood case for convenient storage and makes a beautiful gift presentation. Pen measures 6" in length, black ink and features twist action ballpoint operation. The pen can be refilled with a standard Parker refill. The Engraved Papa Pen Case is personalized with any two line custom message. and gold in his heart. The Perfect Gift for the Perfect Grandfather! Love the quality! And the quote was so cute! Additional Details GiftsForYouNow.com has a handsome collection of Personalized Grandfather Gifts he is sure to love any time of the year. Create thoughtful and unique gifts he can enjoy with family and friends. All of our Personalized Grandpa Gifts include FREE Personalization every day.